This is an absolute first for me! 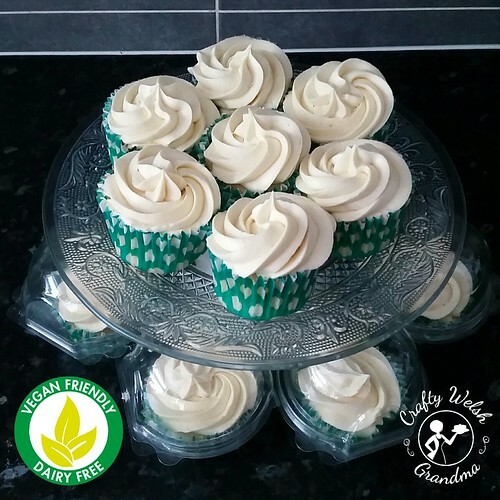 I have never before baked anything Vegan or dairy free, I'd made gluten free, but never 100% dairy free. 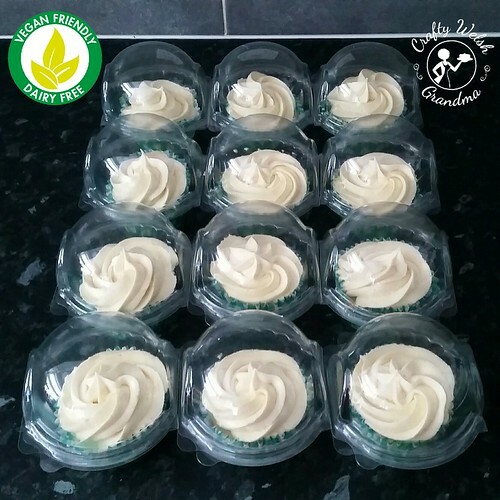 These cupcakes were for no one in particular, I simply wanted to see if I could do it and tick it of of my cakey bakey bucket list. I've been asked for dairy free and vegan sponges and have always had to turn them down, so now's my chance. I'd only purchased sufficient margarine alternative for one full batch, I did this on purpose because I know me only too well. If i didn't like the end product, I'd do them all over again. What I also did was put a call out for help on my Facebook pager asking for Vegan taste testers willing to complete and online survey (the comments will be copied below when they're all in), and I had quite a good response. So, instead of a full cake, I made 'bite size' taster pieces by way of cupcakes. Instead of butter or margarine in both the sponge and the frosting I used a sunflower based, dairy free alternative. I'm not exactly sure if I like baking with this stuff just yet, I find it lacks a little ... substance, maybe. 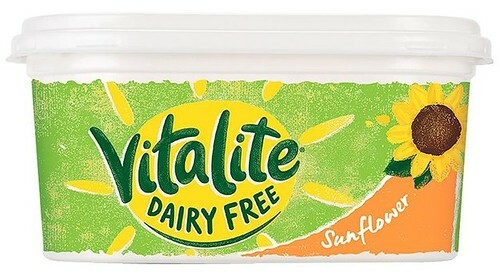 If I've needed to bake a vibrant cake sponge, I've usually used Trex, which is also dairy free and suitable for Vegans. But I used this so I'm going to wait and see what the reviews from the taste testers say. Now the eggs were something else, again I put a call out for help on my Facebook and a number of vegans, my daughter-in-law included, gave me quality information. I purchased an egg free product from my local health store. This stuff was also not without it's problems. Don't forget, I've never baked Vegan before and my lack of experience is, indeed, showing! I found it lacked the volume, even though I added extra water, my cakes were exceptionally pale. Pale to the point actually, that I left them in a few moments more thinking they's brown nicely, and just caught them in time. The volume, or lack of, is problematic for me, so I'm guessing I'm going to have to do some more research and have a little more practice. I also found they didn't rise as good as my vegetarian / usual cupcakes. 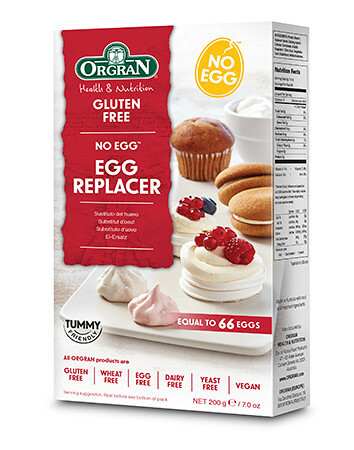 I don't usually need an additional rising agent in my sponges or cupcakes, but experience has shown that this is a 'must have' with this eggless product. So, whilst I can be very critical of my own work, before I start making changes, I need to have the feedback from my taste testers. Meanwhile, here they are, in all their wonderful cupcakiness glory, individually packaged as they're going lots of places. They are without decoration or sprinkles as I didn't want to distract my tasters. When you collected your cupcakes, you would have been given a link to an online survey, if you didn't receive it, please contact me. When completing the survey, please be as honest as possible and even make suggestions for changes if you wish. The overall taste and texture of the cupcakes is delicious. They are sweet and very tasty. The sponge is a little firmer than cakes made using dairy, but still delicious. I'd like the thank all my taste testers for leaving these comments, which have been directly copied from the survey they completed. One Taste Tester chose not to leave a final comment.